Congratulations to Prof. Braithwaite who has been awarded the Shorland Medal for his outstanding contribution to science. This recognises his many years of dedicated work to understanding the functions and significance of one of our most important anti-cancer genes, the p53 gene. See the relevant news paper article here. Funding success for the Maurice Wilkins Centre! Monday, May 12th, 2014 | nif | Comments Off on Funding success for the Maurice Wilkins Centre! Our laboratory is delighted at the renewal of funding for the Maurice Wilkins Centre for molecular biodiscovery, one of New Zealand’s Centres of Research Excellence (CoRE). Prof. Antony Braithwaite is an in-coming principal investigator for the Maurice Wilkins Centre and will contribute to the management of this key conduit for funding of biodiscovery in our country. Dr. Nicholas Fleming is thankful to receive a $100,000 Lottery Health – Research Equipment grant to support the acquisition of a gamma irradiator. The equipment will be used by multiple research groups at Otago for sterilisation and radiation challenge of matter, reagents and biologicals. In our group, we will use the equipment to understand the p53 driven response to radiation damage in cultured cells as this process is one of our primary defences against cancer. Congratulations to Margaret Baird who has been awarded the Derrick Rowley Medal for her service to the Australasian Society for Immunology (ASI). 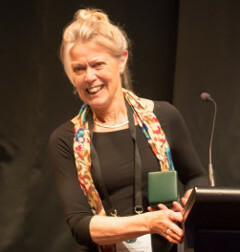 Margaret received this award in honour of her contributions to the ASI which have included: NZ ASI councillor, ASI newsletter editor (for many years), co-founder of Immunet which provided support for the ASI NZ branch meeting and her various roles in meeting organisation (e.g. this year’s Infection and Immunity workshop). Tuesday, November 26th, 2013 | nif | Comments Off on A new Royal Fellow! Congratulations to Antony Braithwaite who has been elected as a new Fellow of the Royal Society of New Zealand. This is a tremendous honour and reflects the remarkable contribution Antony has made both to science in New Zealand and abroad, and to the study of the p53 protein in health and disease. Media link. Congratulation to Antony and Margaret for their successful Marsden funding! Link to the Otago press release, and project summary. The lab has been successful in gaining a slice of the joint-funded HRC/A*STAR cancer research initiative to promote collaboration between investigators in New Zealand and Singapore. The following is a summary of the funding published in the HRC and Otago press release. Principal Investigators: Professor Antony Braithwaite (Department of Pathology, University of Otago) and Professor Boon Huat Bay (National University of Singapore). Project summary:Y-box binding protein 1 (YB-1) is commonly elevated in many human cancers. The cancer-promoting properties of YB-1 are associated with increased resistance to drugs, tumour growth and poor patient outcome. Control of these processes takes place in the nucleus. The precise molecular nature of the active cancer-promoting subtype of YB-1 present in the nucleus is unknown. Identification of this species will provide the basis for a specific and highly prognostic indicator. This proposal, which builds on our recently published analyses of endogenous YB-1, aims to identify the molecular nature of this cancer-promoting subtype of YB-1 and to determine how it functions. From this knowledge we will develop an antibody that specifically recognises only the nuclear YB-1 species and establish this species as a prognostic indicator for human cancers. Congratulations to Antony Braithwaite and colleagues for gaining funding from the Health Research Council of New Zealand to study the role of p53 isoforms in cancer. Co-investigators on the grant are Noelyn Hung, Aaron Jeffs and Tania Slatter, all of the Department of Pathology. Can isoforms of the p53 tumour suppressor cause cancer? Importance of the proline domain in p53 dependent apoptosis. Importance of the proline domain in tumour suppression by p53. Role of the p53 isoforms in p53 function. Interactions between Y-box binding protein (YBX-1) and p53. Investigation into BRCA-1 signalling pathway in ovarian cells.